Where did I go wrong, I wonder? Daughter’s school holidays are taken up with doing courses. Junior will be occupied with some sporty summer camps but his bigger brother? This fourteen year-old, addicted to YouTube and PlayStation, can’t be prised from his laptop. It’s not as if I didn’t have jobs lined up for him to do. Bedroom walls and paint-chipped windowsills are crying out for new coats. “Will you help?” I asked. “I hate painting,” he groaned. Appeals to his munificent nature fell on deaf ears. Based on Bigger Brother’s apathy, I couldn’t dispute. However, to get him doing something – anything, I resorted to tried and tested bribery. He’s broke, having spent the last of Christmas/Birthday money on computer games. We entered negotiations for each windowsill. “You’ll have to dust them down and cover the panes. I don’t want the glass spattered with paint!” “There’s a load of work in that,” he moaned, “That’s worth at least €20 each.” I eventually agreed. After all, I could be spending this money sending him to summer camp and I’d have the satisfaction of spruced up windows. I’d bought a big can of paint in readiness for the task, produced the brushes and masking tape. “For God’s sake, you’re not painting in that,” I shrieked, seeing him togged in his best tracksuit bottoms and t-shirt, “Put on your old gear!” He sloped off and reappeared in older duds. “Where’s the sandpaper?” he asked. A few weeks ago he and his friend painted windows for his pals aunt. I was thrilled as it trained him for this, but now, here was the expert tut-tutting about inadequate supplies. “I have it somewhere.” I had – I’d bought two lots, fine and coarse sheets, along with the masonry paint but where the heck where they? I searched the shed, upending boxes, tools and old paint tins. A bag of Christmas baubles burst open. No, I don’t want to see plastic holly and red glitter right now! I rummaged through the kitchen cupboards, the hall press. Surely I didn’t put them in the wardrobe? Under the bed? I was sweating, time was ticking, my teen was back on YouTube and still no sign of the blasted sandpaper. The cat came in looking for grub and lo and behold, there was the elusive paper slotted behind the cat food. What possessed me to put it there? No more delays. He started the job but with rain possibly threatening, it would be faster if I helped. I began to mask the window frames, but wobbling on a high rickety ladder, tearing strips of sticky tape can be hairy, especially if said strips get stuck in your hair.“Do I have to do a second coat?” the expert asked. “Yes, you can finish it tomorrow.” It was late and we’d make good progress. The job was done, the brushes cleaned and papers swept up. “€15 a window Mom, as you helped.” Fair enough. Spatters, spills, sticky-taped hair and flying sparks. We survived. He’s earned money, I’ve saved on summer camp and got the windows cleaned. At last we’ve done something right! 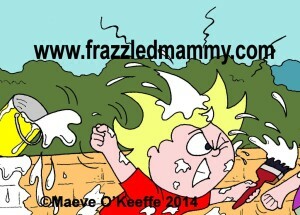 This entry was posted in Parenthood and tagged Cartoonist. 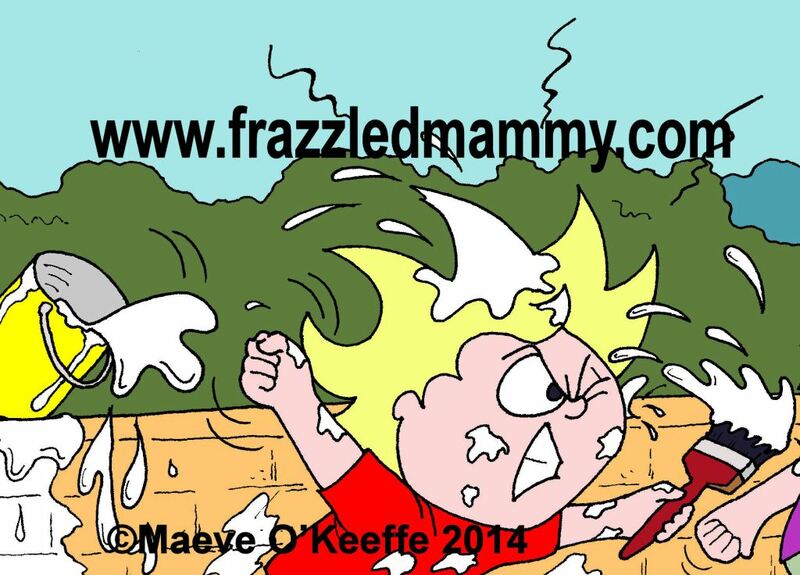 Illustrator, Cork, Ireland, Maeve O'Keeffe, Mother, Parent on July 19, 2014 by frazzledmammy.